Officials with the Denver Fire Department told the local Fox affiliate that two people were inside the building when the blast, which reduced much of the complex to rubble, occurred. 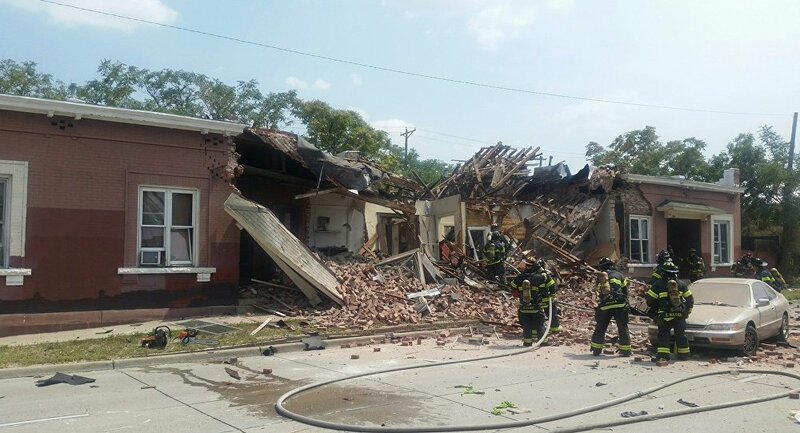 One man is in critical condition at a local hospital and a woman rescued from the rubble is recovering in stable condition. The remaining injured were bystanders who were treated by paramedics at the scene. Some of the injuries were burns from the explosion, Denver Fire Department spokesman Captain Greg Pixley told the Associated Press. Injuries from blunt force trauma were also reported. Because the explosion broke out in a rowhouse, nearby units were also damaged, photographs appear to show. Images show construction materials — bricks, wooden boards, and roofing — strewn throughout the street in front of the building. The fire department tweeted that they are currently investigating the cause of the blast. The local Fox affiliate, Fox31, spoke to a Denver local, Alan Rodriguez, who resides just four blocks from the explosion. Rodriguez told the channel that he thought his roof was caving in when the explosion broke out, and witnessed a "mushroom cloud" of smoke when he went outside to see what was happening. Local business owner David Bacon told WFAA that "There was a couple that was covered in ash that looked disoriented but were OK," and that he heard a huge "bang" while driving nearby.